3) We needed something to do that weekend. At first, I thought this wasn't going to happen. Shari got my flu on Saturday and she spent the night huddled over the toilet. Once I saw that happen, I figured the whole Sunday trip wasn't gonna fly. Sunday morning rolled around and I checked with the mother-in-law and she felt we should stay for Shari's sake. However, Shari insisted and begged us to go. I think she honestly wanted to spend the day in peace and quiet. It didn't take much arm twisting for us to get into the car and take off. We started off a bit later than I had hoped we would: about 9:45. Luckily there was hardly anyone on the road and about 125 miles later we arrived in Wendover (about 11:30). My mother in law (aged 82) was good company and we generally get along pretty well and the trip went by really quickly. Montego Bay was pretty crowded. The first order of business was me to activate our cards so we could earn the comp bonus. Unfortunately, the line was pretty long and there was a drawing that day, which meant people were registering for it. Each person in line probably took at least 2 - 3 minutes and I had a good 6 people in front of me. 15 minutes later I activated my mother in law's card and mine. When I swiped mine, though, I was greeted with a cool surprise: the screen said "Congratulations lottery winner $50 in free play" I was like huh? I figured it was some gimmick, but it printed out a voucher for me. Then I got my $15 slot tournament winning, a 2-for-1 buffet pass and finally my bi-weekly $10 free play coupon. I also registered for that day's drawing. My mother in law and I had a good buffet. I love their cheese blintzes. They've also changed the recipe of the french toast, for the worse. My appetite still hasn't returned from my flu but I still ate well. I definitely couldn't put it down like before, and I paid $18 for the two of us to eat. We had until about 2 to kill at Montego Bay. They were having a 2pm drawing and you had to be present to win. So my mother in law found some machines she wanted to play while I cased the joint looking for my favorite Fu Dao Le. The casinos were jumping; lots of Packers and Seahawks fans betting on the game and with the 7x comps, people were there in droves. 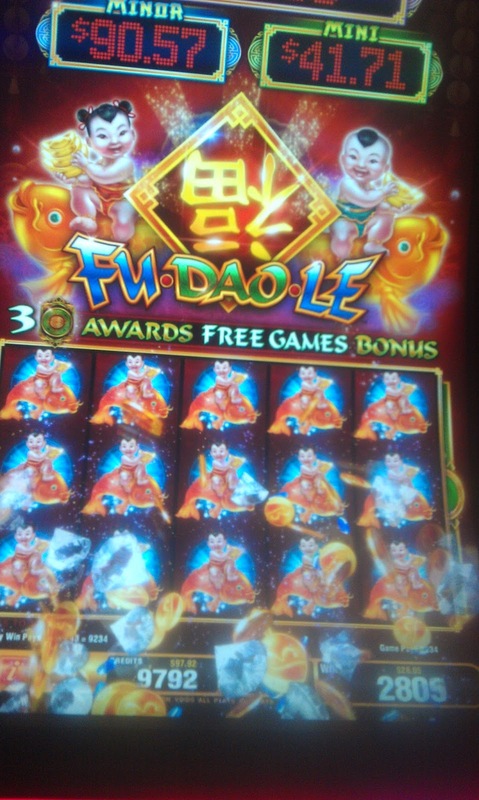 I managed to find a vacant Fu Dao Le (no matter how many they put in, people seem to be drawn to them) and I jumped in and loaded it up with my $75 in free play. Suddenly, I had about $175. I was even more jazzed. I also got lucky and hit a pair of pick 'em bonus rounds. Since it hadn't been hit in a while, the minor paid off at $42 and the second for $20 or so. Eventually the machine started to get cold, so I wound up scooping with about $120. I played some 25 cent video blackjack, mostly to kill time. 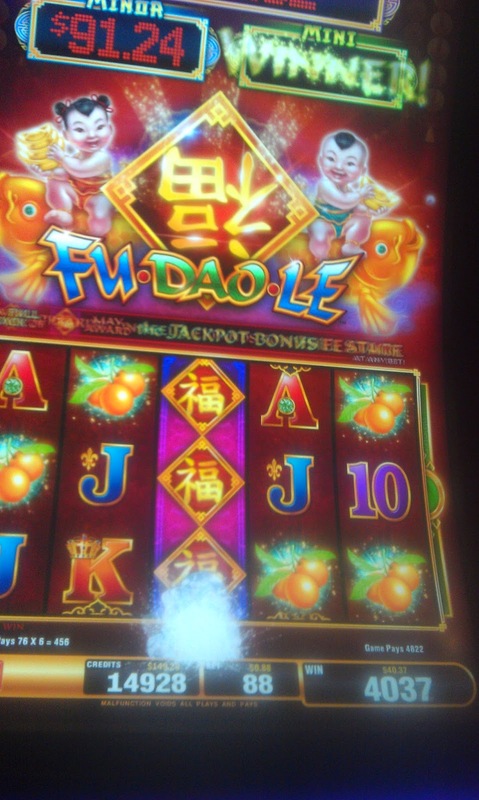 I circled the casino looking for any other vacant Fu Dao Le's but people were glued to them. I didn't win or lose much and finally the 2pm drawing came around. They were only drawing 3 names, 2 for $500 in free play and one for $1000 cash. As expected, our names weren't picked. The mother in law wanted to go to the Rainbow so I got the car and we headed down there. The police, however, had barricaded part of the road. There was also a thick plume of black smoke coming from the Montego Bay's adjunct parking lot. What the heck? As we drove by I saw a large pick-up truck whose engine had caught on fire. 2 foot flames were shooting out of the engine compartment. Just as we passed the fire trucks had arrived. If it had been just me in the car, I would've stopped and snapped a picture. We arrived a few minutes later at the Rainbow. I had a handicap parking placard thanks to my mother in law and I got the best spot in the house. I sort of wonder what people thought of my car in the handicap spot sporting a marathon runner bumper sticker, though. We wound up killing close to 3 hours there. I had mediocre luck, as usual at the Rainbow. I did get a few decent bonus rounds, including a nice bonus on Super Red Phoenix but nothing worth taking a picture of. It was hard getting on any of the fun machines there on account it was so busy. We hung around for the end Packers game and the 4pm drawing. Neither of us were winners. We tossed around the idea of staying for dinner, but I think we were both tired and to be honest we were both pretty full from the noon time stuffing. Also, we wanted to leave winners and best of all, I have a cash stash for my upcoming Vegas / Phoenix road trip. Both of us had a good trip. I am not sure if they turned up the "win" meter at the casinos but I wound up coming home with about $100 more cash than I left with. Shari's mom also had several huge wins and she came home with over a $100 more too. It was really nice to have an additional $75 on the casinos to start with. It just gave me a lot more to have fun with. Thanks to amount I gambled, I have another free meal coming my way next time I go there.